Fire restrictions were enacted Tuesday across much of Southwest Colorado. On a day where people in Durango woke up to hazy skies and the smell of smoke, all of Southwest Colorado entered the first stage of fire restrictions as a result of high fire danger across the region. As of Tuesday, all lands in La Plata County – federal, tribal and county-managed – are in a Stage 1 fire restrictions, which holds a set of bans and provisions aimed at reducing the risk of wildfires breaking out. Restrictions are also in place for Archuleta, Dolores, Montezuma and San Juan counties. Richard Bustamante, fire management officer for the San Juan National Forest, said lack of precipitation over the winter has ushered in fire season more than a month early in Southwest Colorado. 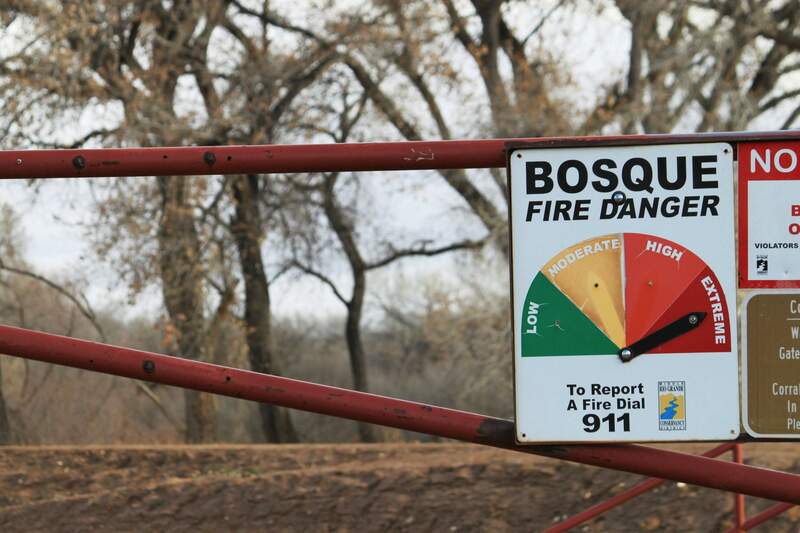 Fire season usually begins in June, just before monsoons arrive in July, Bustamante said. But high and low elevations around Durango and the San Juan Mountains are already at high risk for fire. Bustamante said fire departments across the region have been responding to multiple fires a day since April 1. He compared the conditions this year to 2002, the year of the Missionary Ridge Fire, and 2012, the year of the West Fork Fire near Wolf Creek Pass. “We’re setting records, and not in a good way,” Bustamante said. Butch Knowlton, director of emergency management for La Plata County, said La Plata County was 6.8 inches of precipitation below average for 2017. That trend didn’t stop in 2018: The region is 3.12 inches below average so far this year. Though the fire restrictions are expected to help reduce the risk of wildfire, the provisions don’t address one of the main issues: open burns on agricultural lands that go out of control. Because of state exemptions, it would take an order from the Colorado governor to ban burning on agricultural lands. Yet, it’s exactly that issue that has plagued local fire departments. Tom Aurnhammer, fire chief for the Los Pinos Fire Protection District, said an ag burn recently went from 5 to 50 acres in less than 30 minutes near the La Plata-Archuleta county line. Another burn, south of Durango, went out of control and threatened four structures. A helicopter was called to assist with that fire. Durango Fire Protection District Chief Hal Doughty said since local entities have no authority to ban fires on agricultural land, the best step moving forward to prevent a fire outbreak is education. La Plata County Sheriff Sean Smith said that officers will be on high alert for people not complying with the fire ban. But he said the department would rather people be smart about preventing fire than write tickets. The Forest Service’s Bustamante said firefighting resources are gearing up in Southwest Colorado in case of a fire. Local fire districts have been coordinating, which helps save money by not having to bring in firefighters from other areas. Hot-shot crews are also available for the next month or so. And other resources, like aircraft, are available. All fire officials agreed it’s likely the region will have to enter a more restrictive Stage 2 fire restriction if conditions persist. The Stage 1 fire restrictions prohibit open burning, burn barrels and agricultural burning on private property and state lands south of U.S. Highway 160 in the unincorporated private land areas of La Plata County. The use of a campfire, coal or wood-burning stove, any type of charcoal grill or open fire in any undeveloped area is prohibited. Smoking is limited to vehicles, buildings, developed recreational areas and 3-foot-wide areas cleared of vegetation.Fireworks are prohibited.Use of explosive material is prohibited.Use of any internal combustion engine is prohibited unless it is equipped with an approved and functioning spark-arresting device.Welding and cutting operations must be conducted with a 20-foot radius safe zone free of vegetation with a 2.5-gallon pressurized fire extinguisher or 5-pound ABC extinguisher or pressurized water supply and proper hand tools on-site with a fire-watch individual standing by continuously.Flaring for production wells may be allowed with approval from the designated fire chief.